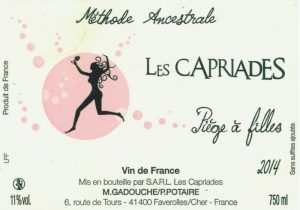 We have been fans of Les Capriades wines for quite some time. We were first introduced to their cuvées at the Chez Remi restaurant in Angers. Later we were offered another of their wines at the charming Casse-Cailloux in the city of Tours (also in the Loire Valley).We finally met with one of the owners, Pascal Potaire, at a lively Saturday morning wine tasting outside Caves Auge in Paris where the theme of the day was the word on everyone’s lips – Pétillant Naturels. “his expertise in natural sparkling making him a reference for other winemakers who want to raise and handle a cuvée of natural bubbly“. Pascal and his business partner Moses Gadouche work from a winery near the Cher River not too far from the city of Tours. Here the wine is aged in old barrels and then bottled when the fermentation has proceeded long enough for the resultant gas that forms in the bottle not to cause damage. 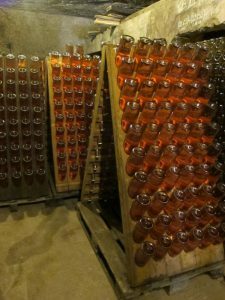 The wine is then left with the bottles upside down as the fermentation continues in the bottle and the most of the remaining sugar is converted to alcohol. When the fermentation is complete there is a puck of dead yeast in the neck of the bottle and this is usually disgorged. Pascale and Moses have a special piece of equipment that they have designed for this messy job. The crown-seal is opened and the pressure of the gas that has been created blows the dead yeast from the neck of the bottle. The wine is then topped up and sealed ready for sale. Eventually we visited their cellars at Faverolles-sur-Cher in the Touraine AOC and met Pascale’s business partner, Moses Gadouche, as well as visiting many of the small parcels they own, which scattered around the region, as well as parcels farmed by other people whose grapes they purchase but harvest themselves. 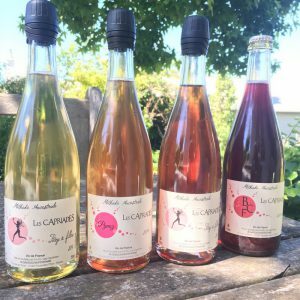 Although Les Capriades occasionally releases a still wine, the domaine, and Pascal specifically, is best know as one of the true masters of pétillant naturels, knowing just when to bottle the still fermenting wines in order to have the right amount of residual sugar and bubbles. Although best known for their rosé and white cuvées, which are always varying degrees of off-dry, in recent years that have been making more bone dry wines, and with their white Pet’Sec in particular, which has extended time on lees before disgorging are truly challenging the notion that pétillant naturels are not serious wines. With length and complexity, is a truly great sparkling wine that can hold its own against other types of sparkling winemaking methods. Les Capriades’ pet-nats are always disgorged, a time-consuming process but one Pascal believes leads to more stability and better drinking. With disgorgement, their wines are clean and unlike some pet-nats are quite consistent and reliable. Such is Pascal and Moses’ commitment to this style of winemaking that for the last few years they have organised, each July, a wine fair in Montrichard called Bulles Au Centre. It is devoted to this style of making bubbles (bulles). Exhibitors (and in 2017 there were over 70) can only show pet-nats and one other (usually still) wine. If you happen to be in France in July it’s a great event to attend. The Rosé Piège à Filles in the 750ml bottles is a pale pink Pétillant Naturel which is a blend of organic Gamay, Grolleau Noir and Côt grapes. The wine is made without any dosage (the addition of sugar) and also without the addition of any sulphur. It has approximately 10 – 15 grams of residual sugar but at this level that makes the drink even more alluring. We believe that this is one of the finest examples of a Pétillant Naturel on the market! Remember that it is packaged in clear bottles and is sealed with a resealable Zork closure. Disgorged early August 2016. The Piège à Filles Blanc Pétillant Naturel is a blend of organic Chardonnay, Menu Pineau, Meslier and Sauvignon Blanc grapes. The wine is made without any dosage (the addition of sugar) and also without the addition of any sulphur. It is possible to detect a tiny bit of residual sugar but it is at a level that makes the drink even more alluring. Remember that it is packaged in clear bottles and is sealed with a resealable Zork closure. The Pet Sec is a wine Pascal and Moses have made to show that sparkling wines made in the Méthode Ancestrale style can be just as complex as other more conventionally made sparkling wines. It spent almost three years on lees before disgorging in late July – early August 2016, which has given it added complexity and finesse. It contains 100% Chenin Blanc and a startling minerality derived from the limestone soils. This is a beautiful wine of considerable elegance with about 10 – 15 grams of residual sugar that cuts through the natural acidity of the Chenin Blanc. The MAGNUMS have been made in exactly the same way and were disgorged at the same time but contain 15% of Cabernet Sauvignon as well. The magnums have between 10 and 12 grams of residual sugar. The Pet Sec Rosé is a wine Pascal and Moses have made to show that sparkling wines made in the Méthode Ancestrale style can be just as complex as other more conventionally made sparkling wines. It spent some time on lees before disgorging, which has given it added complexity. This new cuvée is made from Gamay, Cabernet Franc and Pineau d’Aunis leading to a wine that packs enormous flavour with a lovely persistence. It is quite dry and quite savoury and has beautifully persistent bubbles. It is packaged in clear bottles and is sealed with a resealable Zork closure. 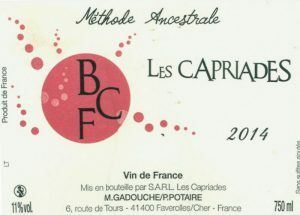 It is the driest of our current wines from les Capriades, with only 6-8 grams of residual sugar. The BCF is a fascinating version of pétillant naturel wine produced by Pascal and Moses. This cuvée is made entirely of teinturier grapes (those that have red skin and red juice). 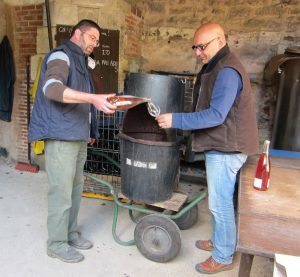 This year they have sourced some Gamay de Bouze, Gamay de Chaudenay and Gamay Fréaux (this is where the name comes from). The wine is made with equal quantities of each variety. This is a truly lovely sparkling wine made using the “Methode Ancestrale” where the fermentation begins in a tank and then the wine is bottled before fermentation is complete. The fermentation continues in the bottles and the yeasts die, leaving a sediment in the bottle. The sediment can be removed through a process known as disgorgement. The result is a beautiful, red sparkling wine which has a lingering, slight bitterness at the end which is nicely balanced by some residual sugar. 11% alcohol.